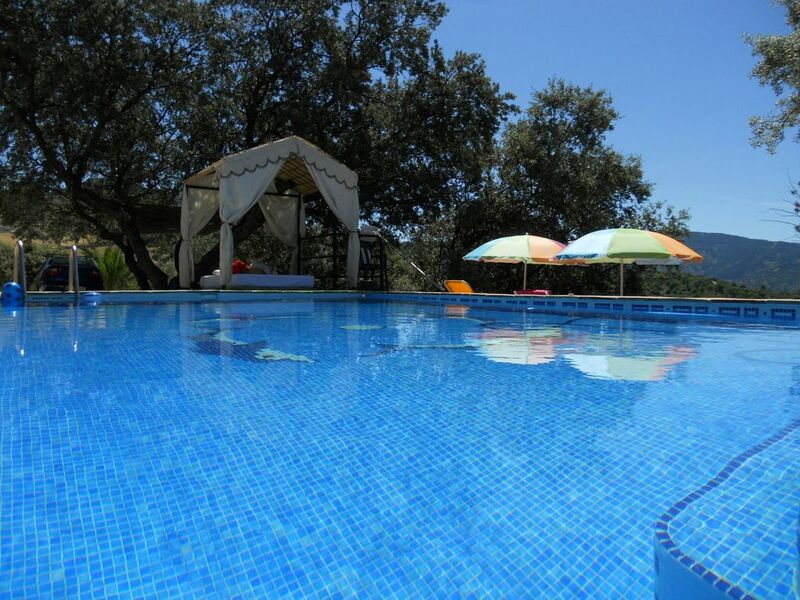 Charming cottage with private pool to 16 Km of Ronda. Malaga airport at 100 Km. The Cottage - Country house is a house that is isolated in the countryside about 350 meters from the village of Alpandeire - Málaga - Andalucía. Ronda - Alpandeire is just 16 Km. (20 minutes drive). Alpandeire is located about 100 kilometers from Malaga airport - Costa del sol. (About 90 minutes drive). The Spanish name of this house is EL CASTILLEJO. The Cottage Country "El Castillejo" has 2 bedrooms to accommodate 5 guests. The price depends on the number of guests and time of occupation. If you are looking for peace and tranquility in the countryside Country Farmhouse "El Castillejo" is the perfect home. Alpandeire is a small village of 250 inhabitants located halfway between the Serrania de Ronda and the Genal high. Alpandeire is only 16 km. From Ronda. The house is ideal for the enjoyment of children / as by the large playgrounds with private pool, swings, bicycles and ping - pong. In your stay you can enjoy nature and the people of Alpandeire while its proximity to the town center. The road is dirt from the village to the house but it's perfectly passable with all kinds of vehicles. Next to the house there is space to park several cars on the same farm. This house has only one bathroom with bath, bidet, W.C. And sink. Our holiday was a success and this was partly due to the fantastic house with a pool and lots of privacy. But also by Santiago: a good and very friendly host who gave us valuable tips and leaded us through Ronda as a guide to attractions. He and his wife made sure that everything in the house, the terrain and the pool is very neatly and clean. And you can freely eat vegetables from the garden (huerta). La Casa Grande in Alpandeire: not super cheap, but delicious and refined. And…. at walking distance. Bodega San Francisco in Ronda (just outside the ancient city gate: good food, low prices, nice spot. Sometimes all tables are occupied. Restaurante Las Banderas roadside Ronda - Benoajan, 2 km before Benoajan: authentic family company, good food, low prices, friendly service The best sangria ever !! Handwritten bill by 'papa'. Ronda: lots to see. Some museums are free one day a week open, but the next week may again another day or another museum. Ask at reception of the museum worthwhile. Setenil de las Bodegas: here the houses are built under and in the rocks. Park the car outside the city center, the streets are very narrow! Sevilla: old center with many attractions. Park your car outside the city, with the Metro you step out right in the center. Ask Santiago details about parking. Cádiz: beautiful coastal town, nice parks with tropical vegetation. Gibraltar: a ‘must seen’. Park your car still in Spain, near the McD. Go walking across the border (don’t forget your passport!!) and take the regular bus to the center for a few euro’s. That’s the simplest and cheapest way. For a total package including cable car and museums you have to pay ten times more. Bus stands about 100 m. behind the border-office. With this comment you help me a bit more to my familiar business and also you help future guests to whom they choose my house to enjoy his vacations with guarantee and choose a guessed right place. We loved our stay at 'El Castillejo'. The pool is a great size and the house was perfect for the four for us but it could easily host a larger family. Set in its own grounds it's brilliant for a nice relaxing holiday. Ronda is a great place, loads to see and do in & around the town. The house is set up great for kids, loads of lovely touches to make it a special place and lots to explore in the grounds. The twenty minute journey from Ronda to Alpandeire has some fantastic views. Santiago is the perfect host - a lovely guy. Always happy to help if required and he went as far as tour guiding us around the area a couple of times. It was a great privilege to be able to help ourselves to the organic vegetables from the house gardens. Great value for money, we would highly recommend this quirky house. Thank you very much for this so nice and sincere comment. I am very satisfied of that you have spent it very well in my house in your vacations. Been Habeis my first British family in my house and I have been lucky because you are a very nice family. My way of working is the same for all my guests, to help them in everything possible in order that his stay in my house is agreeable possible. Regards for all from Ronda, " Dreamed City ".